Do you like working with computers and databases? Do you like designing web pages or developing software programs? Do you like to solve computer and technical problems or develop large systems for storing and transferring large amounts of data? If so, a career in information technology (IT) may be just the career for you. 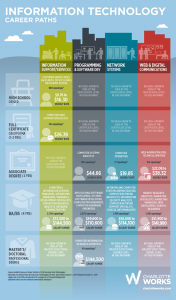 Our Career Ladder outlines each career path available in the Information Technology industry for every level of education. Download the career ladder to discover where your career in Information Technology can start today!